URBAIN LE VERRIER Autograph Signature. French celestial mathematician who accurately predicted the existence of the planet Neptune. Autograph signature on membership card for the Association Scientifique de France. November 1866. 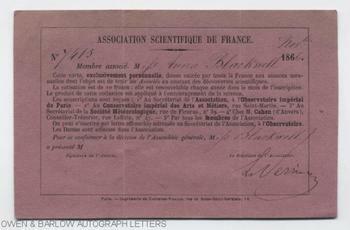 The card, which appears to have been filled out entirely in the hand of Le Verrier, grants associate membership of the Association to Miss Anna Blackwell and is signed by Le Verrier as president. Approx 4 x 6.25 inches. 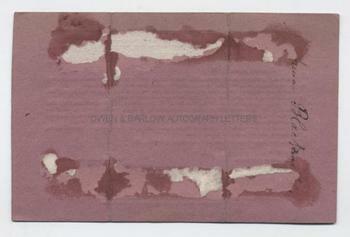 Three horizontal creases and some old mounting damage to verso. Good. Urbain Le Verrier is credited with the discovery of Neptune after he accurately predicted its existence to 1 degree by making very precise calculations relating to the orbit of Uranus using Newtonian principles for gravitational attraction. He was known as "the man who discovered a planet with the point of his pen". Anna Blackwell (1816-1900) was the elder sister of Elizabeth Blackwell, the first woman to gain a medical degree in America and the first to be registered on the British roll of medical practitioners. Anna Blackwell had founded a school in America with her sisters but later gave this up to pursue a career as a poet, translator and journalist. She settled in France, where she translated the French socialist Fourier and the novels of George Sand. Whilst in Franch she wrote weekly columns for newspapers in America, Canada, Australia, South Africa and India, often under the pseudonym 'Felicitas'. Provenance: From a 19th century album compiled by the Blyth family. Edward Blyth, a London Solicitor, was a friend and advisor to Elizabeth Blackwell.